In a very short time the vampire had wrestled Frederick to the floor. Another day, Sir Cobb thought to himself, another dark forest. The one thing having a blade enchanted to strike viciously at evil had done for Frederick was give him some weight as a real knight. Not that Frederick had ever doubted that he was a real knight. Although he had begun to suspect that the Home Knighthoode Starter Kit had not been of the advertised quality. Whilst Frederick was able to easily identify black hearted evil, he was a sucker for less obvious forms of scam. When he had responded to the advertisement he had not questioned it. He trusted material printed in the corner of a general proclamation from the Merchant's Guild of Laventine. None of the signs that may have dissuaded the cautious consumer had rung any of Frederick's alarm bells. Not even the 'low low price' of three groats for all the equipment the starter knight would ever need. To be fair to him Frederick had come a long way since viewing that particular sales promotion. He had slept in cave mouths, meadows, stables and inns. He had paid a field bard to compose a ballad about him, he had seen the mean streets of Vermoniam. In the three weeks since he had left his home Frederick felt that he had really lived. He had certainly gained more minor injuries at one time than he had ever enjoyed as a cooper's apprentice. This did surprise him because making wooden barrels could be a dangerous business. Particularly sp when you were applying the hoops. Life on the road was, it turned out, far more complex than being a cooper. The sheer variety of injuries one could sustain was a dizzying notion if you just devoted some thought to the matter. Right now Frederick had a nailless left big toe, scrapes on both his knees, bruising to his left buttock. Not to mention the remains of a poison ivy rash on his stomach. Also one possible broken rib, defence wounds on his left arm and a cut over his right eye. The bread and butter of his new career amounted to menial work. One innkeeper had him chasing giant rats out of an inn basement. Another saw him trying his hand, briefly, at featherweight cage fighting. He wondered that he had not entertained second thoughts about his career choice. The remuneration from both activities had earned him about the right amount of money to eat quite poorly. By all reasonable standards he should be fed up and ready for the comforts of home. Instead of which he was having the time of his life. After thinking on the matter long and hard he had come to certain conclusions. One was that he had underestimated many things about life. For example, the difficulty of making one's way as a knight-errant. Or, for that matter, the amount of rubbish work your typical knight had to undertake on a daily basis. Thankfully he had also underestimated his own resolve, character and determination. Frederick had, within the bounds of modest decency, always had a lot of time for himself, generally speaking. To find that he could face poverty, physical abuse and loneliness with a smile on his face had done wonders for his self-image. It had not occurred to him that another view of his current situation was that he was an idiot. Further, an idiot who should go home before he got himself seriously injured. Because of his growing confidence, Frederick had agreed to take on something a little bigger. . In exchange for a bed at the coaching inn of Kuppsberg and the promise of a modest bag of silver he was to bring back the head of a vampire. The wicked creature had been terrorising the flocks and herds of the town's Fieldworker's Guild. The town mayor had supplied him with a sack for the purposes of head storage. Frederick had the sack looped through his belt for safe keeping. The vampire's lair was somewhere nearby in the Forest of Grymm. The enormous wood's tracks and paths cross the whole of the Faerie Realm. Frederick's mission was to enter the forest, locate the lair and slay the fell beast. He had undertaken to do so before it could feed once more upon the blood of innocent cows and sheep. It should be pointed out at this stage that this was not the widow's peak and opera cape variety of vampire. Most of these are sorcerers who have traded common decency for unholy power. This was, rather, an aggressive and sizeable variety of bat. Possibly the creature might be suffused with some minor natural magic. The type of vampire regarded more as a dangerous variety of vermin. The giant rat job had paid for a slightly less uncomfortable stay in Vermoniam. Frederick was carving out a niche in the pest extermination arena. This wasn't a career direction that Frederick was entirely happy with. Were it not for the fact that a cow-eating vampire qualified as a monster he might have thought twice about agreeing to the gig. Even so, a giant grumpy flying rat was not the same thing as a troll, an ogre or even a dragon. Not that anyone had seen a live dragon for many years, they were commonly thought to be extinct. Walking among the trees on a reasonably warm spring afternoon was almost a pleasant way to spend your time. This was true even if you were on the look out for vampire droppings. Ironically it was this moment of calm that caused Frederick to question his life choices. He did not believe himself to be an utter fool. He was not expecting to have an arch-enemy, a maiden fair, or a fiery steed less than a month after beginning his adventures. He did, however, expect to feel less like an aimless nobody. He had done a good deal of wandering about and poking his magic sword into things that other people had too much sense to. He had thought this would naturally lead on to bigger and better things. That way of looking at his daily duties did rather tarnish the image of the knight-errant. All you heard in the songs was the glory of competition and the kudos of great deeds. You didn't really think much about that time that Sir whats-his-name spent the day up to his knees in swamp water. Or his grand adventure looking for the rogue lizard-man that had started raiding the local chicken barn. Days like that didn't make for great song lyrics. Frederick thought about taking twenty minutes to stop for lunch. Then he realised that he didn't have any lunch because he hadn't been able to afford any. He decided, instead, to have a little sit down. While he was sitting he considered that he might take the opportunity to spend a few minutes crying. In that moment disappointment and loneliness overwhelmed him. He felt the corners of his eyes begin to sting. "Giving up the hunt so soon, young sir?" Frederick hoped for a whisper of excitement at the prospect of being accosted by a stranger. Particularly as this encounter occurred whilst hunting for vampires in the Forest of Grymm. There was no whisper. Frederick considered that this stranger could turn out to be of help. He could also try to kill or steal from him. Or the stranger could be, and this was by far the most likely,of no use to him whatsoever. 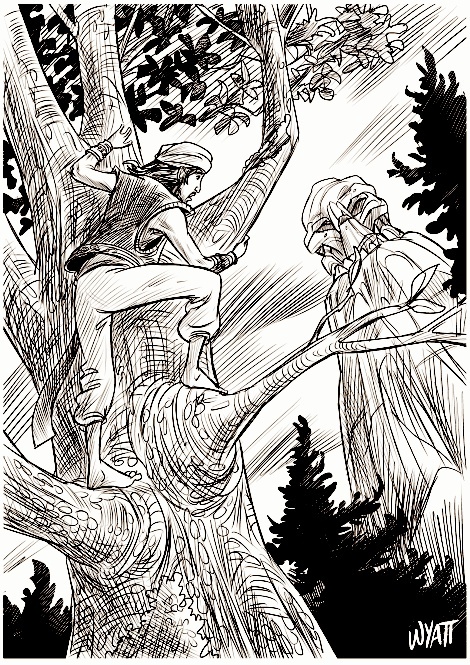 Frederick looked up to see a small boy dressed in green leaning against a tree nearby. The boy had bright red hair sticking up at random angles all over his head. He wore a light green tunic, darker green breeches and no shoes. The boy's pointed ears gave a hint that he was some form of sprite, a pixie perhaps, or a brownie. He didn't look grand enough to be a full blown elf. If the ears were the hint the wings on his back were the full blown announcement that this was a lower order nature elemental. Sprites were well known as having deep knowledge of the weave of destiny. For this reason it was no surprise that the little creature knew who Frederick was and what he was doing. Sprites rarely bothered normal folk, though, so the fact he was talking to Frederick at all had to mean something. "Not giving up, just having a sit and a think," Frederick said. "You think like that too much," the sprite replied. "And you'll die of a broken heart before you solve any of your problems." "Oh, it's not so bad," Frederick said. "It's just... well, I'm a knight-errant in my heart. I have a magic sword that I won for a deed of great daring. I've spent the last fortnight sleeping in doorways and under rocks, now I'm out killing a vampire. It's not all that I could have hoped for when I set out." "So, what?" the sprite said, the little creature lifted off its feet and flitted over to Frederick on its gossamer wings. "You want to give up and go home?" "Not really," Frederick said. "I just wish I knew how many vampires, lizard men and bog-fiends I'd have to kill before I get a crack at something more... more..."
"Fatal?" the sprite supplied unhelpfully. "I want an opportunity to do something that will make me feel like a brave knight," Frederick said. "I didn't know that I would have to create one. I thought... I don't know what I thought." "You thought you'd find one, lying around on the floor, in need of a good home," the sprite said. "It's a common story among your type." "My type?" Frederick asked, he believed he was beginning to feel irritated. That must mean the sprite was quite irritating, because Frederick didn't get irritated easily. "Young men who want to be famous knights," the sprite said. "Oh, did you think you were the first? I've seen dozens like you. I may have a dewy fresh complexion but I'll have you know I was about when the survivors fled from the ruins of Afsana. Those were some dark days, I can tell you. The ones in between haven't been much brighter. Even so there has never been a time, no matter how dark, when ambition resolved into glory without pain and effort." "I know I'll have to work for my ambitions," Frederick said. "I just thought, well, there are hundreds of people who need some help, it can't be that hard to find them, can it?" "That's the strange thing about people," the sprite shrugged. "They are perversely choosy about who they will take help from. If you're not already a hero then they have a tendency to be grumpy if you go around saving them from great peril. You have to earn a reputation, one cow murdering vampire at a time." "I suppose you're right," Frederick said. He wasn't sure that the sprite was correct about the whole thing. Frederick could not believe that people were so strange as to only want certain people to help them when they were in trouble. The thing about making a reputation out of jobs well done, that definitely made some sense. "I had better be about finding that vampire then," Frederick said. "Good day." "Wait, kid," the sprite said as Frederick turned to leave. Frederick turned back to him. "You think I make a habit of seeking out gawky hopefuls in forests so that I can hand out pithy advice? Sorry, but this is my working time, not my leisure time." "You want me to pay you?" Frederick asked, puzzled. "No, dummy," the sprite said. "I've got a delivery for you. If you want it." The sprite reached up into the air and plucked something out of nowhere. He held out a gold ring, criss-crossed with intricate engravings, four small jewels were inset around the band. "What is it?" Frederick asked. "It's a ring of destiny," the sprite replied. "Look, kid, between you and me, there's some folk, um, upstairs, that have got their eye on you. They believe you're cut out for, well, something important. You'll get there without the ring but this here speeds up the process a little. Slip it on your finger and your life will get a lot more interesting." Frederick was the kind of person who always fell for a slick sales pitch, an advertiser's dream. He was not, however, a complete idiot when it came to sprite magic. There was a great deal to read between the lines of the sprite's last statement. So much that you could make at least two more volumes of material out of subtext alone. "I can do without it?" Frederick said. "So isn't that ring sort of, cheating?" "Destiny's an odd duck," the sprite said. "It takes a liking to some people but that doesn't form any sort of guarantee. In the great weave there come up opportunities for deeds of great import. Destiny has its chosen for those tasks, Destiny knows that one can fail, another will come along. The ring was designed to ensure that those who could, would. It's not essential, but I would definitely call it recommended." "Aha! That's why destiny likes you," the sprite said. "You can be plenty sharp when the fancy takes hold." The sprite continued to hold forth the ring of destiny, Frederick continued to hesitate. "Look," the sprite said. "I'll be straight with you. All this comes down to a choice. Either you definitely want to fulfil the potential that destiny has marked out for you, or you may as well give up and go home. It doesn't matter if you can make it without, if you don't take the help then you will only find yourself asking one question in the end." "Did I truthfully want to take this path?" the sprite said. "It's that simple, kid. Right now, you get to decide. Step up or go home. What's it to be?" Frederick had wanted to be a knight as long as he had known what a knight was. Looking at the sparkling gems, twinkling from the golden band of the ring of destiny Frederick understood. It didn't matter if he was battling an ogre or ridding an inn of outsize rodents. He could accomplish either action in a manner befitting a knight. A knight wasn't defined by what they achieved, they were defined by who they were. "The ring of destiny changes nothing about a person," the sprite said, as if it could hear Frederick's thoughts. "It just gives a person more opportunities to show the world what's inside." Frederick reached out and took the ring from the sprite. He slipped it on the ring finger of his right hand. "Attaboy champ," the sprite said. "We're all rooting for you upstairs. Now, it's time for you to step up." Frederick felt a tingle run through him. It was only a small thrill but it ran bone deep. When he looked away from his new accessory the sprite had gone. Frederick took a moment and looked around at the woods. Nothing was substantially different to the way it had been before. Frederick was still hungry, still no closer to finding the vampire, still not sure how to proceed. The problem was that the hunting ground for a single vampire was so big, and full of hidden corners. The vampire's lair could go undiscovered for years. How was he supposed to find it in a single day? Of course, he could wait for sundown. Even minor league vampires received the strength of ten men after sunset, they were uncommonly tough and fast. Frederick believed that the moon sword would take care of the toughness issue. The only hope of besting the thing in single combat would be to face it before nightfall. The problem appeared insoluble. It would be a hard enough job for an army to find the vampire's lair, let alone one knight alone. If only, he thought, there were two, or even three of me, that might give me a chance. There was another tingle from the Ring of Destiny. A strange warm feeling came from Frederick's right hand ring finger and spread upwards into his body. The feeling filled up his entire body from head to toe in an instant. Frederick began to feel very big, all of a sudden... no, not big, full, like he had eaten three roast dinners and pudding besides. The feeling of fullness grew and grew until it reached a point where Frederick though he might burst apart, and then he did. There was a popping, tearing noise and Frederick found himself face to face with... Frederick. Frederick and Frederick looked at each other amazed. Before they could speak the tingling started again. It rise up faster this time. The expression upon both Frederick's faces turned from astonishment to alarm. The pressure built a second time and pop, tear, four Fredericks now stood in a circle. The process repeated five more times. Until there were over one hundred Fredericks assembled in the Forest clearing. Once they had all worked out that it wasn't going to happen again most of the Fredericks looked about as if searching for something. Eventually all eyes settled on the original Frederick. Frederick the first looked about into the sea of faces that looked identical to his own. He looked at the identical grubby clothing, the identical worn boots. There were differences between the duplicate Fredericks and Frederick the first. None of the copies had a moon sword at their hip, none of them had a ring of destiny on their right hand. Frederick the first realised that all the copies were waiting for him to say something. "Um, find the vampire," he suggested, an edge of uncertainty in his voice. One hundred and twenty seven Fredericks split up and vanished into the forest. The original Frederick hoped they were all searching for the vampire's lair. "This is most odd," Frederick muttered to himself. He picked a direction and followed his doppelgangers to join in the search himself. Even with a small army of Fredericks it took the better part of the day to locate the little cave hollow where the vampire had hidden. Frederick could not tell which of his copies had found it, he didn't even know how he would tell them apart. All he knew was that one minute he was looking up at a rock and wondering if it was worth climbing it. He wanted to see if there was entrance to a cave system on the top. The next minute he felt an odd giddyness. He reached out to clutch at the rock for support but everything blurred and rushed away from him. He felt that he was, at one and the same time, standing still and speeding through the trees. He found himself flying faster than he could ever have thought possible. Then there was a feeling of being thin, not slim but flat, like a sheet of parchment being shuffled into a sheaf. There was a moment of that tingling fullness again. Then he was in a dark cave listening to the wet snuffle of a large, smelly beast as it slumbered. The moon sword began to sing. It always sang to him, a low, flat tone, when there was evil nearby. Frederick was not sure if any one else could hear the note, nobody ever acknowledged it anyway. When Frederick had been in Vermoniam the sword had seemed to sense evil at every other street corner. Nobody had ever picked him up on it. Not wanting to worry about it now he drew the sword and stepped forward into the cave. The sword glowed with a soft white light, mirroring the light of the moon. The white light revealed the walls of the vampire's cave. The moonlight cast jagged shadows making the cave appear like something from a nightmare. The vampire hung by its feet in the rear of the hollow, enormous leathery wings folded around its bulging furry body. As Frederick had expected it was the monstrous kind of giant-bat vampire. The wafting smell of sour blood that washed over Frederick when it exhaled, reminded Frederick to act with caution. Frederick wasn't squeamish, and he wasn't afraid to kill the vampire. Despite this he still found himself needing to psyche himself up to the task. He forced his arm to draw back, preparing to strike at the beast. He didn't know whether he needed to behead the vampire or to stab it in the heart. He knew all the stories, of course, but they tended to be about sorcerous vampires. It was well known that sorcerers were hard to kill. There were always rules regarding the successful accomplishment of the task. These rules were always secret. Minor vampires were tough, but did you have to spear their heart or behead them, or burn them? Would anything else heal in the moonlight? Frederick didn't know. This quest was turning out to be quite the eye-opener, even if it was for all the wrong reasons. There was nothing he could do about it now. He decided that he would try and stab through the heart. He didn't have confidence that his short sword would be up to the job of a single stroke beheading. Setting his jaw and planting his feet on the ground Frederick drew back his right arm. Then he thrust it forward toward the vampire's body. He was aiming for a spot about halfway along the vampire's torso where he believed the heart would be. Not only was the vampire's hide tough but the leathery wings wrapped around it weren't easy to penetrate either. The sword went through one and the vampire woke up in an instant. It tried to separate its wings and pulled Frederick's sword off course. 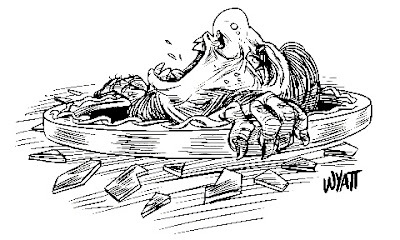 It missed the centre of the vampire's body and instead plunged into the monster's side. The vampire did not bleed, instead a thick, black, soupy ichor issued from the wound. The vampire opened its mouth and screamed, a piercing noise that set Frederick's head to spinning. The monster dropped from the roof and spun in the air. Its wings folded over its back and two spindly arms ending in spade-like clawed hands reached out for Frederick. Frederick made a mental note to book himself in for basic combat training at the earliest opportunity. He stumbled backwards waving the moon sword at the vampire. It appeared that the initial swipe hadn't done much more than annoy the creature. A short and ignominious scuffle followed. It quickly became clear that the vampire, whilst not a better fighter than Frederick, was stronger. It was also less self-conscious than the hapless knight. The vampire made short work of wrestling Frederick to the floor. It screamed into Frederick's face and then plunged its fangs into Frederick's neck. Frederick, confused and frightened, expected pain, it was known that a vampire had venom in its bite. Frederick was too muddled to understand that he was probably going to die. Frederick did not, in fact, die, instead he got another tingle from the ring of destiny. The weight of the vampire appeared to decrease. Frederick attempted a roll to throw the creature off. The tide of strength had turned and the vampire squealed with dismay as Frederick threw the creature off him and leapt to his feet. Not sure how long the rush of strength would last Frederick picked up his sword. He hacked wildly at the vampire until he was quite sure the loathsome thing was dead. Frederick staggered out of the cave, exhausted. He stored the head of the vampire in the sack and slung it over his shoulder. Outside the cave twilight was sucking the light from the day. If I need anything, he thought, as he made his way back out of the woods to collect his reward, it's a bath and a good night's sleep. Tomorrow, his train of thought continued, I am looking for someone to teach me how to do this properly. Which is what he did, but that is not a story we shall tell today. 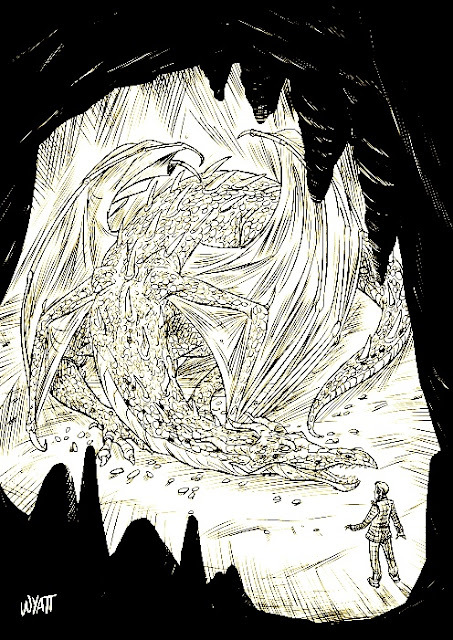 Scattered about on the floor around the dragon's body were the scales missing from the patches of bare stone. Lester was pretty certain that they had managed to fall through a skylight. Thankfully, the skylight had no actual glass in it. If it had then that could have been troublesome. Not that their landing had been particularly comfortable. They appeared to be covered in books and bits of paper. Lester had never heard a mouse scream before. He had not expected it to sound like it did, it was far less squeaky than he had imagined it would be. "I hate bats!" the mouse said. Lester looked over to where the tiny creature was sitting in the ruins of its pumpkin gourd. It crouched up on its hind legs to look at a picture resting against the floor. The picture was, at one and the same time, simplistic and quite horrible. It depicted a bat, wings folded, perching on top of a tree, in the background a shooting star streaked across a pitch dark sky. There was some kind of symbolism or other arty nonsense going on, because the bat was enormous, or the tree was very small. Lester wondered if it was, in fact, a normal bat on top of a bonsai. His train of thought hit another startling realisation and was instantly derailed. "You can talk!" he said. The mouse swivelled its head to look at him. "Your moustache has come loose," it said. Lester reached up to his face to prod at the waxy false moustache he had been sporting. He had believed it appropriate during his brief and undistinguished career as a goblin trader. It had, indeed come away on the left hand side and was now hanging limply beside the right hand corner of his mouth. He grasped the offending article between his fingers and pulled it off his face. He couldn't see anywhere to put it tidy so he dropped it onto the floor. "So, you're just going to dump it there?" the mouse asked him. Adding to the stack of new experiences today had already thrown at him, Lester now knew what it felt like to have a rodent make him feel guilt. He picked the moustache up again and thrust it into his pocket. "Sorry," he said. "I was... a bit confused." "Too confused to be tidy?" the mouse asked. "No, well, just... this is so... I mean... isn't this odd, don't you think?" Lester asked. He took a moment and got on to his feet so he could have a proper look around, and up. They had, in fact, fallen in through a hollow skylight. They had landed to one side of a pile of books mounted on a desk. Their passage had up ended the desk and scattered the books all over the floor of the small room. Mixed up with the books were a number of loose leaf sheets of manuscript paper. Scrawly, illegible handwriting filled them all from corner to corner. The painting of the bat was not the only work of art adorning the walls of the room. There were many strange pictures hung from the walls, there were more stacked up, some up to five deep, on the floors. The room was not a regular shape, Lester had to count, there were nine walls. In the domed ceiling the skylight was the only window. About two and a half feet away, spitting the odd shower of blue and orange sparks, was the broomstick. The other trader had offered him the item as 'security' back in the market. Either that had been a trader's joke or Lester had the short end of that bargain. "In the last twenty four hours," the mouse said, "my life has been turned on its head. My home, the pieces of which you may now see lying about my feet in small orange chunks, rolled down a hill. 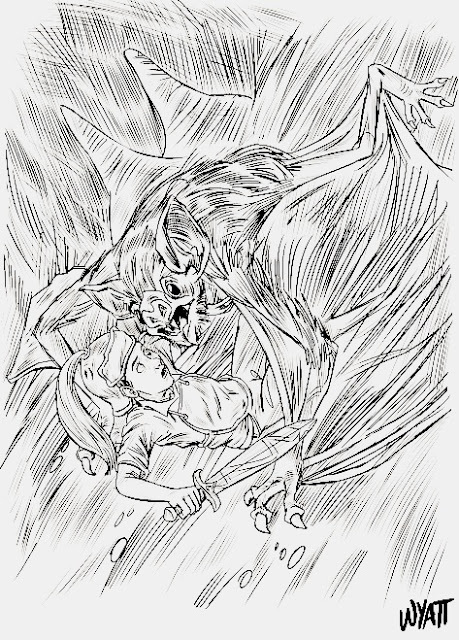 I was nearly eaten by," the mouse spared a glance at the picture, "a giant bat. I took a ride on a shooting star. I heard a silly story about a knight who was a wolf. I went inside a tent that had more stacks than apparent square footage. I met a mermaid, briefly. I felt a disturbing flutter of deja vu. To top it all I disappear from the side of my only companion in a whirl of blue and orange fire to end up here with you. I left odd behind some time around the gnome deciding it had better things to do with its time." "I don't want to talk about the gnome!" the mouse tried to stamp its foot but, being a mouse, the effect was underwhelming to say the least. "Where do you think we are?" Lester asked. There was a door in one of the walls. Lester was not keen on the idea of opening it until he was a little more certain what he might find on the other side. "Somewhere else that isn't home," the mouse replied. "So what difference does it make?" "Hmm," Lester said. Then, too troubled to ignore the fact any longer: "Look. I don't mean to be intrusive or show my limited life experience or anything, but... You can talk." "So it would appear," the mouse replied. "That's not a usual thing, for mice to talk," Lester said. "Then I would imagine you could say that I am not a usual mouse," the mouse said. It made a little motion with its front legs that could have been a shrug. "Are you going to try the door or am I going to have to start stacking books?" "I want to find out where we are," Lester said. "And what better way to do that than to open the door?" the mouse asked through grated teeth. Lester was finding that he was getting used to the mouse. The longer he watched it do quite un-mouse-like things, the more accepting he was of this unbearable cuteness. "Well, I hope there's not a tiger out there," Lester sighed. He picked his way over the fallen detritus of hardcovers to reach for the door handle. "If there is," the mouse said. "Then we'll have to face it eventually. I would be more concerned, to be honest, if it turns out to be a broom cupboard." Lester paused with his hand upon the handle. "Why would you care if it's a broom cupboard?" he asked. "Well, unless it had the decency to be a _magic_ broom cupboard," the mouse explained. "It would mean that we find ourselves trapped, until we manage to span the fifteen foot gap between the floor and the skylight." "Oh, yes," Lester said. "I'm still not sure that's worse than a tiger." "So, we've established that you would rather not be eaten and I would rather not starve to death. Illuminating." "You are a very sarcastic mouse." Lester pushed down on the door handle. The door was not locked, there was no tiger on the other side and it didn't open onto a broom cupboard. "It's a hallway," Lester said. "A bit dingy but it doesn't look either unpleasant or dangerous." "No alcoves or other shadowy places that might provide a hiding place for lurking assassins?" the mouse asked. "No suspicious, raised floor stones? No holes in the wall from which poison tipped darts might fire, using an ingenious compressed air system?" "Sarcastic and paranoid," Lester said. "No, none of that, well, not that I can make out in the gloom. Besides, it's the only exit, what choice do we have? We're pretty much forced to go that way. We should probably get on with it." "You sound just like Rachel," the mouse said. "Impossible. Come on then, pick me up, you can carry me on your shoulder, left or right, I don't mind, it's your choice." Lester went over to the mouse and put out his hand, the mouse clambered up onto it. Lester moved the hand up to his left shoulder and the mouse jumped off his hand. Lester could feel little claws through his shirt sleeve, they were sharp but not pressing down hard. Lester stood and went to the threshold of the doorway. He took one final chance to examine the gloomy hallway for signs of any traps before stepping forward. "Who's Rachel?" Lester asked the mouse. "The little girl, who left me with the mermaid," the mouse said. "I have a terrible feeling we're related." "Oh?" Lester said. He took a step out into the hallway. "Related how? By marriage?" The two of them remained free from attack by assassins. There were no ominous clicks, poisoned darts did not spring from the holes that weren't in the walls. "No, blood related," the mouse said. Confidence growing Lester took some slow and careful steps along the hallway. In the distance he could see that it turned to the right. "I'm not trying to speak out of turn," Lester said. "But I have difficulty with the concept that the two of you might be blood kin. Just saying." "No, that's fair enough," the mouse said. "I've been having some difficulties. with my memory. I am pretty certain I wasn't always a mouse. The clues are definitely there now I look back at it, you know: being able to talk, being called James, stuff like that." James the mouse paused, and then said: "Oh, yes, I'm James by the way, pleased to meet you." "Lester," said Lester. "Pleased to meet you James the currently-a-mouse." "Now that I come to think about it," James said. "I'm not sure I am pleased to meet you. You don't seem very honest and you were exploiting that poor mermaid." "Oh, that," Lester said. "That, uh, it wasn't what it looked like. Or, maybe it was, I don't know. I think I was doing someone a favour, or maybe he was doing me a favour. I know that the mermaid needed someone to help them and... well... it was all most complicated." "Hmm," James said. "This place is strange. The walls aren't as regular as they were, look." James was right, the walls of the hallway had become jagged and uneven. The passageway was still broadly the same shape but now it appeared less constructed and more as if it were a natural cave tunnel. The light, such as it was, was also dimming to a point where Lester was having to feel his way along with his right hand on the wall. Lester strained to make out any detail in the darkness. He couldn't see anything but his fingers met a wall in front of him. For a second he panicked as he felt his way along a smooth shelf of rock in front of him. Then his hand went past the point at which he believed the opposite wall should exist. He turned his head to see a dim light in the distance. "There's a bend in the passage," Lester said. He groped his way forward and the light situation began to improve. As they got closer to the light the passage opened up into a cavern. "I really hope this is a way out," James said. Lester considered pointing out that building a long passageway leading to a single room would not be a profitable use of time. Further you would have to consider the sanity of someone who undertook such a project. This went double for someone who decided the room needed nine sides. Then he decided against it. The mouse was nervous and had been through a lot today already. It was probably best to just keep going forward and hope for the best. "It's a dragon!" he squealed. His exclamation was so forceful that he almost fell off Lester's shoulder. Following James's alert Lester went from squinting mode to scan-for-danger mode in a fraction of a second. He blinked his eyes and rubbed them, willing for the giant glowing mass of shimmering light to resolve into the shape of a dragon. His ears strained to catch the ominous whisper of a dragon breathing. Lester's vision did adjust, slowly. The pair continued to not be eaten or roasted alive. Lester started to reach another high peak of safety on the roller coaster that his emotional state had become today. When his vision had adjusted Lester could see that James was right, the source of the light was definitely dragon shaped. This dragon, however, was a stone carving. Lester could see parts of the enormous beast showing through its coat of shining yellow metallic scales. These scales were the source of the light. Scattered about on the floor around the dragon's body were the scales missing from the patches of bare stone. They didn't appear to have their own light, like the ones that remained attached to the dragon. They did reflect light well enough to bounce reflected images here and there around the walls of the cave. "I think it's a statue," Lester said to James. "It's not moving, anyway." "I'm not sure it is a statue," James said as Lester stepped closer to examine the scales. "I think I remember something." "Like what?" Lester said stooping to pick up a scale. It was round at one end and flat at the other, the surface was a perfect mirror. "Like something about dragons and stone and them not being dead," James said. "Did I mention I'd been having some memory problems?" "You might have mentioned it," Lester said. He wasn't paying much attention. He had moved on from the scales to look into the dragon's eye, a great, flat reflective disc. It was slightly bowed outwards so it distorted the image of Lester's face. It made his nose look big. James, on the edge of the reflection, still perched on Lester's shoulder, looked small. Out of the shimmering play of lights surrounding Lester's image in the eye a picture began to resolve. The face of a little girl, a different little girl to the one from the Bridgetown Market. The image slowly pulled itself together out of the shimmering sparks of colour reflected in the dragon's eye. "What are you doing inside my mirror?" asked the little girl peevishly. "I'll have you know I'm a princess so you'd jolly well better stop being inside my mirror right now." Lester and James exchanged a puzzled glance. "We're not in your mirror," James said. "We're beside a dragon." "Oh," the little girl said. "A talking mouse. Interesting. Okay, well, if there's a talking mouse then I guess you can be inside my mirror after all..." The little girl paused and looked about herself. "Um," she said, puzzled and uncertain. "What's all this shining stuff?" In front of Lester the dragon's eye began to grow, larger and larger until he could see all of the little girl. He observed her well groomed pigtail plaits and her impossibly frilly lemon dress. He had a few moments to admire the incongruous heavy walking boots that emerged from under the lacy fringe at the bottom of the skirt. "What are you up to?" the little girl asked, alarmed. "Stop it at once!" Before either of them knew it they were standing opposite one another surrounded by a sparkling shower of light. Then there was movement from above. Lester focused on it, realising as he did so that he had become rather dizzy, and understood that the dragon's eye was closing. "Oh, dear," said Lester but it was too late to do anything, even if there was anything to be done. The dragon closed its eye and the sparkling shower dimmed to a background glow. Standing in the cave, next to the gigantic stone dragon were now Lester, James and the small frilly girl in the heavy black boots. "You," the girl said crossly. "Are in such big trouble you don't even know how big it is!" As it happens, she was right, but we'll find out how some other time. To the right of his view Saeed could see something very unusual. A great rock pillar that seemed to grow from nothing in the centre of the garden. Atop the pillar was a mishapen formation of rock that reminded Saeed of a skull. We must always remember that some people do not enjoy the best start in life. We should also remember that some people make bad choices. This is a story about a young man who falls into both these categories, his name was Saeed. Saeed was born in the city of Afsana, the capital of Old Araby, some time ago. It is difficult to say exactly when for a variety of reasons. Yesha, the old washerwoman who had been the midwife at his birth raised him from infancy. The back alleys behind the bazaars of Afsana are not the ideal place to birth a child. Saeed's birth mother had been sick and weak. Yesha had saved Saeed at the mother's request, but in the process the woman had died. Yesha took Saeed in and taught him the value of honour and the importance of having a code to live by. The two loved each other very much. Yesha hid nothing and told Saeed that his real mother had died. The boy didn't care and called the old woman mother anyway. As he grew to become a smart and strong little boy so Yesha also aged. Towards the final days of her life Yesha could not rise from her bed. She could no longer wash laundry or do the dozen other little tasks that had brought food to their table. Saeed tried his best to take over what he considered to be the family business. He found nobody would pay much attention to the little boy that had followed the washerwoman around for the past few years. Now he was old enough to be a bother they called him thief and threw stones to get rid of him. The streets of Afsana taught Saeed how cruel people can be when they are allowed the liberty to be so. Yesha, the only mother he had ever known, grew sick with hunger and age. Saeed burned with anger that the only person who had ever shown him love and kindness should be the victim of such neglect. His fury grew as he considered all she had done for the people around her. "If thief they call me," he said to himself. "Then thief I shall be." At first the fact that nobody noticed him helped enormously in his thieving endeavours. His only regret about his new path was that Yesha believed that he was providing for them both with honest work. The longer the new life continued the more Saeed felt that he should be truthful with his mother about the source of the food on their table. The longer it went the sicker she became; Saeed's shame at the lies he was telling grew. The more he stole the harder it became to come clean. One day, Saeed returned from the souk to find a dark figure stood over the washerwoman's bed. "Who are you?" Saeed asked the cloaked figure. The figure turned, pulling back the hood that covered its head. Underneath the cowl the figure was revealed to be a young woman of extreme beauty. Her skin and hair were silver-white, her eyes shone like rainbow coloured diamonds. Saeed had never seen anyone like this before. "I have come to free your mother from her pain and suffering," the woman said. "I offered her a bargain so that she could continue the good works that she performed in life." "I know that mother would appreciate such a chance," Saeed said. "She did indeed. I did not know she had a son. She has gone already." Saeed was puzzled, he looked over to the bed. "I can still see her, underneath the covers," he said. "That is her body, Saeed," the young woman said. "I liberated her soul." When Saeed heard these words he knew who the young woman was. Sadness and anger welled up in his chest. He cried out as a terrible pain gripped his heart. He ran to the bedside and kneeled beside it, but it was too late, his mother's hand was cold. "Saeed, do not weep," the young woman said. "Your mother was a good woman and she has been given a new chance to do good work. All of the love she gave to this world will multiply and spread throughout a thousand realms. There is no need to mourn." "I never told her," Saeed said, as tears rolled over his cheeks. "I never told her what I had become. Now I never will." The young woman said nothing. Saeed bit at his cheeks trying to drown out his sadness with pain. When his tears were under control he said: "I am nothing but a dirty little street thief. Mother believed I provided food for us with hard work. I would have, but that nobody would give me a job, and mother was so ill. I meant to tell her. It was never the right time." The young woman touched Saeed's shoulder, the skin tingled where her fingers made contact. "You can find her, Saeed, so that you may make your peace," she said. "But the path will not be easy." "Anything," Saeed replied. "I must make amends with her. I cannot live with this shame." "Then the first thing you must do," the young woman said. "Is to gain entry to the caliph's treasure store, within the grand palace. There, in the central vault, is a sapphire that the caliph has named 'The Shooting Star' because it is so bright and clear. Within the jewel is a magical garden, that is where your journey will begin." "How can a sapphire contain a garden?" Saeed asked, too puzzled to be sad for a moment. The tingle on his skin had stopped, the young woman was gone. Saeed had asked that last question to the empty air. There was now only one way that Saeed could get an answer to his question, he had to go to the palace treasure vault and find the magic sapphire. Saeed had never been inside the palace walls before, but now that he was alone in the world he had no fear of being caught. Even so, at sunset, standing before the shining white palace walls, Saeed paused. He bowed his head, not in prayer, but so that he could concentrate upon his words. "Mother," he said. "I lied to you, and that is shame that I must bear. I swear to you now, wherever you may be, that no more lies shall ever pass across my tongue. Though I may have to take things that do not belong to me in order to survive, I must never deny my nature to any one ever again." With the feeling that he had made as much peace as he was able to for the moment, he began to scale the palace wall. The ascent was the most difficult that Saeed had ever attempted. The palace walls were the smoothest in the whole of Old Araby. Fortunately they were also among the longest, and hence impossible to keep entirely free of blemishes. After no more than two tolls of the night bell Saeed had reached the summit. Once within the bounds of the palace Saeed benefitted from the fact that nobody expected him to be there. Ironically it appeared that stealing from the souk, where there were many thieves was hard work. There was competition in the souk and not much worth stealing. Here he was alone and within five hundred paces of an enormous treasure vault. Saeed was acutely aware that if he were discovered here he would immediately be put to death. All the other thieves in Afsana were aware of this also, as were the palace guards. This meant that the guards patrolling within the walls did so without much in the way of concentration or vigilance. Saeed evaded them easily and found his way towards the treasure rooms. The grand palace was an enormous structure but its design was simple and elegant. Saeed followed patrolling guards and, one by one, each guard route took him deeper and deeper into the palace. Saeed, like most thieves, knew how to tell the rank of a guard by his attire. The more important a guard was the more careful you were not to offend them out on the streets. Inside the palace the rule appeared to be that the more important the guard the closer to the centre of the palace they patrolled. Even with this obvious pattern of duty Saeed made a couple of wrong turns. Once nearly walking into the caliph's private chambers. once more cutting close to the private bath house and on the final, hair-raising, occasion Saeed nearly found himself in the guard house. Saeed was concerned that it would soon be morning when he finally found the grand colonnade that lead the way into the treasure vaults. As he walked along the shining marble floors towards the vast halls that contained all of the caliph's most treasured possessions Saeed felt humbled at the scale and magnificence of the building. Saeed had heard tell that the architects of the grand palace had been blinded after building the impressive structure. He was not surprised at this, the streets of the bazaar had told him everything he needed about pointless selfishness and cruelty. "All of this grandeur, mother," he said to himself. "And none of it compares to the lullabies you sung me to send me off to sleep." Saeed was surprised to find, as he entered the vault and walked among the heaped piles of treasure, that the obvious wealth and power of the caliph did not impress him, nor did it really make him angry. This palace and these treasures existed and the caliph chose to believe that they belonged to him. Saeed understood that all things were at the whim of fortune, a caliph could become a pauper in a day at fortune's hand, so what was any of it worth? In the centre of the treasure vault was a small covered room with a single doorway. Inside the room were a number of pedestals, mounted on each pedestal was one of the caliph's most remarkable possessions. In the very centre of the room, resting on a velvet cushion, was the largest sapphire Saeed had ever seen. Saeed approached the sapphire agape with wonder at the jewel's size, clarity and brilliance. He had to use both hands to pick it up. "I still don't know," he said. "How there can be a garden inside a sapphire." He brought the shining surface of the jewel close to his face and as he did so he believed he could see something inside the facets of the sapphire, bounded by the smooth cold walls of the cut gem. As he peered into the heart of the stone, concentrating harder on the object he believed he had noticed, the surface of the jewel seemed to shift, to become fluid. 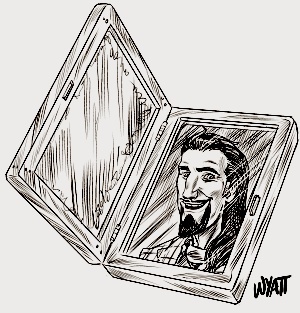 Saeed could hear water and the call of birds, he could smell vegetation and feel warm sun in the cool treasure vault. The surface of the stone turned to a curtain of clear running water, Saeed stepped through it and fell head over heels. In panic he wheeled his hands, thrashing and twisting as he hit the surface of a cold, clear pool of water beneath a waterfall. Saeed had grown up his entire life in the bazaar, he did not know how to swim. Thankfully, the water of the pool was not deep. Saeed's instinct to survive helped him to gain his feet. Once he was standing, waist deep in water, he looked about the place that he had landed. The air was warm but not hot like the bazaar in the dry season, just pleasant, like the shade of the rooms near the entrance to the souk. Saeed had never seen so much green, the pool had rock shelves, covered in moss, to either side of the waterfall. On the far side a grassy bank stretched from one edge of the pool to the other. Beyond the bank tall trees crowned with broad glossy leaves reached up to the sky. Saeed checked the waterfall but it appeared that there was nothing behind the curtain of falling water. It was as if he had stepped from a wall of solid rock. Saeed did not question, this had been the intended effect. At least he no longer had to worry about escaping from the Grand Palace. Saeed left the water. The warm air was already drying his skin and clothes. He found a solid tree and climbed up to the top to get a better view of this garden. At the top of the tree he could see that the forest went on for many miles in every direction, there were some small hills and a place where he believed there was a river. Looking back at the pool he could see that the water from the waterfall exited via a small stream which could feed into the river about three miles hence. Lacking any better plan Saeed slid back down to the ground and set off for the pillar. As he walked he started to feel tired, he had been awake since the previous sunset, he had a feeling that in Afsana it was coming on for dawn. He did not know what time it was in the garden but the day appeared to be growing warmer, so he guessed that it was not yet noon. The day became hot and still as Saeed walked towards the rock. As he approached a clearing that surrounded the base of the pillar he found evidence that someone had been here before him. Nestled in the grass was a small square of yellow metal, an intricate and regular design engraved into its surface. Saeed bent and picked up the object. Upon examining it he found that there was a hinge at one end and a catch at the other. Saeed worked the catch and the object sprang open. Inside the metal frame was a small compact mirror. Saeed blinked, surprised by his own reflection. "This is a strange object to find in a garden," Saeed said. "I wonder who it belongs to." With those words the image in the mirror warped and shifted. The face lost colour from its skin, aged, a dark beard sprouted from the chin, the eyes shifted from nut brown to ice blue. "What a stroke of luck!" said the reflection in the mirror. "That is, the mirror is mine. While I have your attention I wonder if I could beg of you a little favour. I was the victim of poor circumstance, not to mention, ah, a small explosion... Suffice it to say that I had to leave that area in something of a hurry. I left a bag of supplies in the cave on top of the skull pillar. I wonder if you could see your way clear to returning it into my possession." Saeed was tired and had already seen several strange things in the last day alone. He did not have much surpise left that a strange bearded man should appear inside the mirror's surface. "Who are you?" Saeed asked the man. "My name is Joshua," the man replied. "Listen, you're probably going to want to get my bag back to me before nightfall, Poliocephalus Giganticus will awake at dusk. I think he mostly eats things about the size of a small dog but he may view you as a competitor for hunting rights. I think he could get... aggressive." "Poli-what... ?" Saeed didn't understand half of what the man had said, but it did not sound good. "Uh, a bat," Joshua said. "A giant bat. You will need to be careful when retrieving my bag, our nocturnal friend is sleeping now but he will be roused by noise close by. Do you think you can be quiet?" "Oh yes, sir, I think I can manage that," Saeed replied. "Good boy," Joshua said. "That's the spirit. How far are you from the skull pillar?" "Not far," Saeed said. "I can see it through the trees." He paused for a moment, preparing his next statement in his mind. "Sir, I am happy to help, but you must understand my position. My name is Saeed Ibn Abihi, the great weave has determined that my station in life should be as a humble thief in the streets of the bazaar in Afsana. I have little in the way of possessions, save for the clothes on my back and the sense in my head. If you treat me fairly then I will return the courtesy. If you do not, I feel it only right to inform you that I shall take from you what I can, and I will feel no remorse for the act." "An honest thief indeed!" Joshua said. "Despite the worrying implications of your tale. Bring me my bag Saeed and I promise I will treat you fairly." "I will trust you to be a man of your word, sir," Saeed answered. "I shall retrieve your bag and contact you again." Saeed closed the mirror and made his way over to the pillar. Compared to the palace wall scaling this rock face was simple. The cave in the left eye socket of the skull rock smelled of animal droppings, it was very warm and appeared to wind a long way back into the cranial vault. Saeed could hear the sigh of the giant bat nestled in the darkest shadows. Sure enough Joshua's bag lay on its side, near to the cave entrance. There was a large soot mark on the floor where something had exploded. Saeed did not stop to consider this, he retrieved the bag and climbed back down the pillar. Back in the shade of the trees Saeed opened the mirror again. "I have the bag, Mister Joshua, now how do I get it back to you?" he asked. "Open the bag, you'll find two vials of liquid tucked into the hood, one will be green, the other will be blue. Drink the green, then the blue. Fly away from the skull in the direction that it is looking." "Sorry Mister Joshua," he said. "Did you say.. fly?" "Indeed, and be quick about it, you'll have to fly about four hours to get to me, and one hour you'll be within the bat's hunting range. Sundown isn't for another two hours, but still." "You are a very strange man, Mister Joshua," Saeed said. "But I shall do as you ask." "Excellent," Joshua said. "I shall brew some tea." Saeed closed the mirror and undid the buckle on Joshua's bag. He slipped the mirror inside amongst the jumble of boxes and envelopes that Joshua wanted returned to him. Sure enough, tucked into two holding straps in the flap of the bag were the two vials that Joshua had described. Saeed unstoppered the bottle of green liquid and swallowed it, making a face because its taste was intensely unpleasant. He took the second vial and swallowed that too, it tasted no better. Saeed did not have time to dwell on the unpleasant taste of the concoction because the second he had swallowed the blue liquid he felt something rise up in his belly. It was a sensation like he was about to do an enormous burp but the strange tingling pressure continued to rise up past his mouth, through his nose and up to the tip of his head. The sensation also worked its way down, through his guts, down his legs to the tips of his toes. Tingling from head to toe Saeed began to rise into the air, slowly. Panicking he tried to reach for the ground, his ascent stopped and he spun round his middle head over heels. After a couple of minutes he managed to get himself upright again, then he twisted to pick up Joshua's bag. He found that all he needed to do to rise above the tree line was to desire to fly up to that height. Whooping with joy Saeed did a huge loop in the air, swooping so low over the upper leaves of the trees that he could touch them. After a couple more aerial acrobatics he pointed himself in the direction of the skull's gaze and flew in a straight line, as fast as he could. It turned out that 'as fast as he could' was very fast indeed. He sped over the garden until the trees became a blur and kept going out over meadows and fields, over rolling hills and past small towns, never stopping, never slowing. By evening he found that he was drifting closer and closer to the ground, the odd giddy sensation of flight had died down. As the moon began to rise Saeed found himself outside of a small farm house in the middle of more rolling green meadows. The door of the farmhouse opened and Joshua appeared, a tall, thin man, dressed in a manner that Saeed had never before seen. "My bag!" Joshua exclaimed. "I bid you greetings young Saeed. As promised I have brewed tea, and, as you are my guest, I have had my wife bake some cakes to go with. Shall we go inside and share our stories with one another?" "Of course, Mister Joshua," Saeed replied. "I will tell you of the vow that I made to my mother, for I have a feeling you will have some ideas about where I should go next." So Saeed and Joshua went inside to enjoy their tea and to share their stories, but the tale of what happened after will not be told today. Rachel was right up close to the tank, sharing a wide-eyed glance with the fish-tailed woman. "...A story for another time? What kind of an ending is that?" "That's the end of the story. The wolf is dead. Avan Weatherstrong bested his opponent. All is well." "But what about the silver sword, and the Moon Maiden? And who was the servant, you know, really?" "It's not important, it's just a story." "Then I won't tell you any more." "Tabarnas Riseandshine! Are you wasting your time telling stories again?" Tabarnas Riseandshine looked over his shoulder. He peered into the shadowy interior of the 'Riseandshine and Titsadaisy Goblin Merchants' stall. He turned back to the small child sitting at his feet, a mouse sitting upon her shoulder. He put a finger to his lips indicating that the child should be quiet. "I am just resting my old bones, dear!" he called back. "I was getting the back pains again." "I'll give you pains," the voice came back. "We have too much stock that needs sorting out. It's Saturday Market tomorrow and we need to have all our most valuable wares on display." "I'll be along directly, dear," Tabarnas said. "Just give me a minute to get back on my feet." "Is that your wife?" the child asked. "Wife? Ah, well, no, sort of, it's complicated," Tabarnas replied. "Is it another story for another time?" the girl asked. The corner of her mouth turned down in a cute grimace. A clear indication that she was still not happy about the conclusion to the story of 'Avan Weatherstrong and the Stalker Wolf'. "No, not a story it's just, well, Cressidia and I are Goblin Merchants, and very old with it," Tabarnas explained. "We're together, till death do us part, but it's more of a... er... contract than a marriage." "Hmmm," the child said. "I have to say," she continued after considering this for a moment, "I'm not sure I understand the difference." "Well, maybe when you're older yourself," Tabarnas replied. He got up from his step stool and shuffled along towards the flap at the back of the stall. "I should probably see what Cressidia wants. My eardrums have been known to burst with the shouting when I really annoy her." "Wait!" the child called out. Tabarnas turned back to her. "You still haven't told me where I can get some help. And I still don't know where I am." "I told you that first of all," Tabarnas objected. "The first words out of my mouth! You are in Bridgetown, at the Patchwork Market. This is the only marketplace of significant importance to all creatures of all worlds." "But where is that?" the child asked, a note of pleading in her voice. "You don't understand. I have come from, well, a very long way away, I'm not entirely certain how I got here. All I have is my friend James the Mouse, his pumpkin and an unreasonably grumpy gnome who comes and goes as he pleases." "Rachel," the child cut him off. "My name is Rachel." Before Tabarnas could say anything else Cressidia appeared at the flap of the stall. Her expression told Tabarnas that he may have to find that ear-ointment before long. The soothing balm they had picked up the last time they had passed through Rolling Meadow. It was the only thing he'd found to soothe the ache of a jolly good telling off. "Oho! Not wasting your time on stories, eh?" Cressidia asked. "I should have known. You're just unbelievable. Most of the time I don't think you care a jot whether the people you accost even want to hear your stupid stories." "I only asked for a little help," Rachel said quietly. She had been a much louder girl before Cressidia came out of the stall. Cressidia had that effect on people. "Help?" Cressidia asked, beaming broadly. "Well, you've come to the right place: Titsadaisy and Riseandshine..."
"Riseandshine and Titsadaisy," Tabarnas corrected her. Cressidia shot him a glance that could have boiled oil. "It's alphabetical," he finished more quietly. "Either way," Cressidia said, her tone still smooth and warm. "You will find what you require in the finest Goblin Merchant's stall in the whole of Bridgetown and that's for certain." "Don't bother, Cressidia," Tabarnas said. "The girl has nothing to trade, she's lost, as I understand it." "There was a bat," Rachel supplied helpfully. "And a bright light... and a gnome." "Do I look like I have spare time to listen to you prattle on about your life, child?" Cressidia asked, her tone much harsher now that she knew Rachel had nothing in the way of spending money. "Er, no," Rachel said. "I was just explaining, because I'm on an adventure." "Well go and be on an adventure somewhere else," Cressidia said. "We have work to do. Come on Tabarnas, I need you to find that sample box from Dr. Pygmalion's House of Potions. I think it's in that trunk from Old Araby." Tabarnas followed Cressidia into the stall. He observed that Rachel, carrying her pumpkin, mouse on her shoulder, was following. She was being careful to stay out of Cressidia's line of sight. Tabarnas did not relish the idea of sitting alone and sorting through a box of junk, so he did not say anything. Cressidia and Tabarnas had owned their warehouse stall for a very long time. So long that it no longer struck him as even mildly interesting that the space within the three canvas walls was so great. Considerably greater than the size of the small tent structure might have indicated from without. Tabarnas took some pleasure in Rachel's evident wonder and surprise as they made their way through the stock room. Her eyes were like saucers and her mouth hung slightly open as the navigated the maze of six-foot tall shelving units. "At some point," Cressidia said, "we will have a major clear out, mark my words." Tabarnas did not mark her words. He knew full well that she had been promising to clear out the warehouse for at least two centuries, probably longer. The amount of stock in the stock room had only increased in the intervening time. Cressidia couldn't bear to part with anything, except in trade. The thing about a straight trade was that you got one item back in exchange for the item you traded. Cressidia was far too skilled a goblin merchant to only get back goods of equal value in any trade. The massive stock room was a mark of honour among the merchant class. So it grew ever larger. A clear out was not on the cards any time in the foreseeable future. "That Araby chest is down there at the end and to the left, you need me to show... oh..." Cressidia had turned on her heel and Rachel had not been quick enough to duck out of the way. "Sorry," the little girl said, her eyes shining with fear. "I just wanted to help out. So maybe you would help me out." "When did I ever suggest that we needed any help?" Cressidia said. "Because we don't, get out, go on, on your way." "But... but... I can't find my way out now," Rachel said miserably. "I didn't know that your stall would be so big and contain so many wonderful things." Calling the stock 'wonderful' was a fine diplomatic move. Tabarnas saw an opportunity. Cressidia's heart was as cold as ice but, like ice, it could be melted with the right heat. "I'll look after her, she can help me sort the trunk," Tabarnas said. "What if she's a thief?" Cressidia asked. "I'm not. I promise!" Rachel objected. "And if she is we can report her to the Master of the Market," Tabarnas added. "Kalico doesn't tolerate thieving." "Very well," Cressidia said. "But she helps for the joy of helping, no promises of help in return. And you," she pointed a finger at Tabarnas, "sorting only. No stories!" "I don't think I can remember any more stories at the moment," Tabarnas lied. "I'll be checking on you in one hour, I want that box of samples, do I make myself plain?" "Oh, yes, quite," Tabarnas answered happily. "Come on Rachel, let's get to work." Tabarnas and Rachel walked down the alley between the shelves that Cressidia had indicated. Tabarnas turned to the left at the end and sure enough the Araby Trunk was sitting on the floor at the end of the stack. Tabarnas pulled his keychain from his belt. His nimble fingers quickly selecting the correct key from the massive bunch. He unlocked the trunk and peered within. "So what are we looking for?" Rachel asked looking over Tabarnas's shoulder. "Oh, don't you worry about looking for it," Tabarnas said. "It's just a box of love potion samples." "Love potions," Rachel wrinkled her nose in disgust. "How soppy." "Love potions sell, young lady," Tabarnas said. "Don't you forget it if you ever want to become a goblin merchant. There's always money to be made from fools and the miserable." "That doesn't sound very nice," Rachel said. "Got nothing to do with nice," Tabarnas said. "I don't like to go hungry, neither does Cressie, so we sell things, so we eat. Nice don't enter into it." Tabarnas reached into the muddle of junk in the chest, he grunted as he pulled out a large, dusty book and tossed it onto the floor. Rachel instantly went over and examined the cover. "Professor Tumblescrape's Elementary Defensive Cantrips," she read. "What's that?" "Book of Spells," Tabarnas answered. "Just some basic alchemy. I'm trying to clear some room." Rachel thumbed through the book. "I can't read," she said. "Never needed to." "Wouldn't make much difference if you could," Tabarnas answered. "Books like that are written in Alchemese, the language of Alchemy. I suppose it might mean something if you could read that. That would make you an alchemist, though, and they're... well... Let's just say you wouldn't be wandering around Bridgetown asking for hand outs if you were an alchemist." "I never asked for a hand out!" Rachel said crossly. "I asked for help. It's not the same thing." "Free help is a hand out," Tabarnas said. "Even I know that." "Well, let me do something for you," Rachel said. "Then you can help me as payment." "Well, you could start by helping me with this," Tabarnas said. "It's too big for me to move myself. Just take the end and be careful." "What is it?" Rachel asked. "What's magic about it?" Rachel asked. Tabarnas shrugged. "I tested it for magic, I don't know what kind it is until I identify and catalogue it, and I haven't." Tabarnas slid his fingers under one end of the mirror's cool, hard frame. Rachel slid hers under the other. "Lift carefully on three," Tabarnas instructed. "One, two, three." Both of them strained but the mirror would not shift. It had fallen flat into the box and other items landing on top of it had wedged it tightly between the back and front sides. They strained a little but the mirror wouldn't move. "Drat!" Tabarnas said. "I'm sure the box Cressy wants is just down here, underneath the mirror." "So what do we do?" Rachel asked. "We should find something to ease it out with, some kind of grease or oil." Rachel's mouse came up to her ear, it squeaked in her ear briefly. "How do you know that, James?" Rachel asked. "But you said you'd never left the garden!" "We shall be talking about this later on," she said. Then she looked up at Tabarnas. "Would rainbow grease do the job?" "Oh yes," Tabarnas said. "But you can only get that from the tail of a merperson. We don't have any in at the moment. It's highly prized as lubricants go." "James says he saw another merchant with a mermaid in a tank about two minutes walk away," Rachel said. "James," Tabarnas said. "Is that the mouse? You talk to mice?" Rachel looked at the mouse and back to Tabarnas. "I talk to this mouse, this mouse is my friend," she replied. "So he talks?" Tabarnas said. "There would be some money to be made from a talking mouse." "He's not for sale!" Rachel said. "He's my friend, not my possession!" "Very well," Tabarnas shrugged. "But if you change your mind..."
"I won't. Now, shall we get this rainbow grease or not?" Tabarnas nodded in agreement. He, Rachel and James the mouse wound their way back out of the stall to go in search of the mermaid. Sure enough about seven stalls away there was a small tent that displayed an unhappy looking mermaid in a tank. There was a man stood next to the tank wearing smart pinstripe trousers and waistcoat over a cream shirt. He sported a thin waxed moustache and his hair smelled of butter and sugar. He'd combed it into greasy curved lines highlighting the style, short and neat at the back and sides, longer on the top. "You looking to buy mermaid products?" he asked Tabarnas. "I got tears of the Undine, I got bottled songs, I got scales..."
"Rainbow grease," Tabarnas said. "In your smallest size." "Certainly sir. I have one ounce tubs for a single silver piece," the man said to him. Tabarnas did not know much but he knew that one silver piece for an ounce of rainbow grease was overcharging of the worst kind. Tabarnas looked over at the mermaid. Usually the poor creature's unhappiness would not have troubled him, but today Rachel was right up close to the tank. The little girl and the fish-tailed woman shared a wide-eyed glance that would make a golem teary. Tabarnas did not need to ask to know that Rachel was not happy seeing the mermaid cooped up in the tank. "A silver piece? I don't have anything that small. It looks like I shall have to buy the mermaid, what do you want for her?" The merchant looked a little surprised at the question. "I cannot sell you Teleosti," he said. "She is my livelihood." "You're a merchant aren't you?" Tabarnas asked. "There should be a price on everything." "Well, maybe for a bag of no less than five hundred gold pieces," the man replied. Tabarnas understood from that ridiculous price that whatever this man was, he wasn't a merchant. For a start merchants talking to other merchants didn't keep talking about coin. There was far more value and fascination in barter. Now Tabarnas wanted to purchase the mermaid out of a sense of outrage that such an idiot should be allowed a stall because of one. "I can give you... a magic mirror," Tabarnas said. "Simpler business and fewer... ethical compromises. Those things are bound to do your bidding. You'd need a smaller, less expensive pitch in the fortune teller's quarter, you rake in the coin and the mirror does the work. Much more lucrative than fish by-products. What do you say?" "Uh," the idiot had clearly never considered this as an option. No true merchant would ever give up selling and buying to become a sideshow attraction. This fool, on the other hand, was clearly considering the offer. "Yes, I think I will do that," he said. "But I want to see the mirror first." "Well then, I will need an ounce of grease, and I will bring you the mirror directly." "Do you think I am stupid?" he said. "I am not going to give you a pot of grease and never see you again. Pay for the grease or pay for the mermaid. No freebies." "How would it be if I offered you a little... security?" said Tabarans reaching into his pocket. He pulled out a tiny broomstick between his finger and thumb. Once he had it clear of his pocket he shook the tiny object and it quickly grew to full size. "It's just a portable flying broomstick," Tabarnas said. "But it's worth one gold piece. You can have that as security against the grease." The portable broomstick would, indeed, have been worth one gold piece. Save for the fact that this broomstick had developed a fault since becoming infected by a virus from a pair of ten-league boots. Tabarnas did not consider that the foolish merchant needed to know about that. After all he would only have the thing for five minutes. "Very well," the foolish merchant said, taking the broom. He handed Tabarnas a small tub that contained an ounce of rainbow grease. "Come on Rachel," Tabarnas said. "We should get this man his mirror." "James is staying here with the mermaid," Rachel said. "So that she isn't lonely." "Whatever makes you happy, we'll be back before you know it." "Let the mouse stay," the foolish merchant said. "All the more reason for me to believe you'll come back." Rachel put her pumpkin down and James climbed inside it. Then she and Tabarnas went back to the stall. Before long the edges of the mirror had been smothered in rainbow grease. Tabarnas and Rachel had slipped their hands under the free ends again. "Once more," Tabarnas said. "On three. One... two... three..."
Unfortunately, the rainbow grease did far too good a job this time. The mirror did not stick at all it flew out of the chest and into the air. Spinning and twisting, end over end. "Don't let it break!" Tabarnas shouted but he was too slow to catch the flying mirror and Rachel was too small. The mirror landed on the floor and the glass in front of the reflective surface smashed outwards. The sound of the breaking glass rang loud throughout the tent, jangling with the added tone of magical power. Then there came another sound from the broken surface of the mirror. "Cooooooooooooooooobb!" shouted a terrible voice from within the frame. A pair of gigantic clawed hands curled over the frame, a head covered with shaggy hair followed. A pair of furious yellow eyes looked around as a gigantic troll pulled itself through the frame of the mirror. 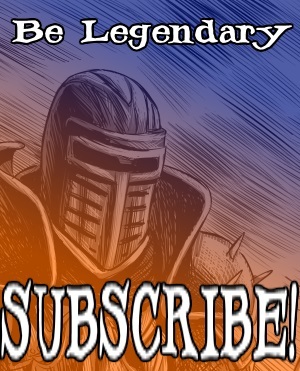 "Where is that useless excuse for a knight?" the troll demanded, looking at Tabarnas. "I haven't seen a knight!" Tabarnas responded, truthful but scared. "You tell me where I can find Cobb!" The troll shouted. "Or I will smash this stupid place apart!" "But I don't know!" Tabarnas objected. "Graaaaaargh!" the troll shouted. "Yaaaargh!" As good as his word the troll struck out with a meaty arm at the nearest shelf, intent on destruction. The magical security system at work in the stall detected the malicious destructive intent. The system zapped the troll away from the valuable stock outside to the market. "Where did he go?" Rachel asked, terrified. "The anti-vandalism charm!" Tabarnas answered. "It sent him outside." "But James is outside!" Rachel shouted and she scrambled to her feet, running into the stacks. "Wait!" Tabarnas cried out. "You don't know the stacks! You'll get lost!" Tabarnas hurried after Rachel but the girl had gone. He looked around following the route out but Rachel had gone and got herself well and truly lost. "One thing at a time," Tabarnas said to himself, looking about at the trail of destruction the troll had left outside. 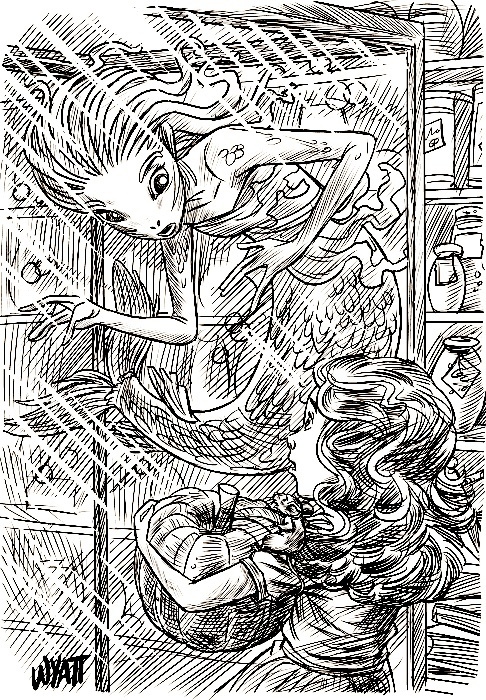 He made his way back over to the mermaid stall where the foolish merchant, James and the pumpkin were nowhere to be seen. The mermaid was still in her tank but a fresh crack in the bottom right hand corner allowed the water to leak slowly away. "What happened?" Tabarnas asked the mermaid. The young woman swum up to the top of the tank so she could speak in the open air. "The troll chased away Lester," she said. "He swung the broom at it and it took off. It hit the pumpkin and then all three of them... vanished." "Oh... oh dear," Tabarnas said. "Oh this is an awful mess." "What's going on?" the mermaid asked. "I lost the girl. I broke the mirror. I set loose the troll and I've sent that broomstick off with the little girl's mouse and pumpkin attached," Tabarnas said. "And I've cracked your tank." "Where are my samples, Tabarnas Sunshine?" came Cressidia's voice from nearby. "Oh, yes, and I still haven't found the samples," he said. "I think I will definitely need some ear ointment." He looked up at the mermaid who was looking back down at him with an expression denoting utter confusion and despair. "Come on, young lady," he said, undoing the brakes on her tank and putting his shoulder behind, rolling it back towards the stall. "We'd better find some way of sealing up your tank. Then we can sort out the rest of this mess." He grunted as he wheeled the mobile tank back towards the stall. As they crossed in front of the smashed up store fronts of the other traders Tabarnas had time to examine the chaos. Nothing worse for business than an escaping troll. Tabarnas believed that he couldn't be any more miserable. In such circumstances there was really only one thing that could cheer him up. "Young lady," he said, looking up at the mermaid. "Do you like stories?"